Image from the Mammoth Trumpet. Source: CSFA. Click to enlarge somewhat. While we wait patiently for the definitive word on the rumoured exciting new developments regarding the 14,000 year old, pre-Clovis Manis Mastodon site near Sequim, Washington, I thought it was worth a new post to pass on an article a regular reader of this blog brought to my attention. The Center for the Study of the First Americans, the same organization who is now re-analysing Manis Mastodon, have for many years published a very informative newsletter they call the Mammoth Trumpet. Some of the early issues are online, including one which has a 1987 report on the Manis site(PDF). I had not seen this before (the whole archives are worth a post on their own) and the article has some interesting information, including the picture above. Detail of representation Manis bone point x-ray. Source: CFSA, Mammoth Trumpet. Click to enlarge. As you can see, there is a “drawing of a xerograph” (“photocopy, in current parlance) of the x-ray of the Mastodon rib which is causing current excitement. It does look pointed! Although it is, of course, a low-quality reproduction of an interpretation of an x-ray, if I follow the text correctly. Nonetheless, it is the only actual representation of the “bone point” I have seen. It doesn’t penetrate as far as I might have imagined, and the tip appears to be stubby (though doubtless strong, considering the likely compromises of strength vs. sharpness needed in bone technology. Nonetheless it is “stubbier” seeming than the Gaadu Din 1 bone point mentioned previously). Of equal interest is the image to the left, which shows a bone flake, plausibly produced by percussion. This is the first actual image of the bone alterations at the site which I have seen. And, in the interests of following along with the development of the site as we await the current research results, which I expect to focus very narrowly on the bone itself, the Mammoth Trumpet article contains lots of information about how the site was found, and excavated. It sounds extremely challenging! Gustafson was standing waist deep in muck when he found the bone in question, which was what transformed a more casual visit to a palaeontological site into an urgent need for archaeological excavation. This probably accounts for the poor ability to draw associations between the cobble spalls and simple stone tools found and the Mastodon itself. Also of interest is the useful field reasoning that Gustafson showed. Finding only one side of the Mastodon, he reasoned people might have displaced the other half nearby, disarticulated. This proved to be the case. And, he reasoned they might not want to camp in the gravelly muck, and that there might be a drier campsite nearby. Through regularly spaced cores fanning out from the find, he followed the buried post-glacial land surface along until it started to rise to a slightly elevated, presumably drier, paleo-hummock. Backhoe excavation there went through Mt. Mazama ash and, while no archaeological remains were found of Mastodon age, more recent stone tools were found and incidentally, bison remains which may have been butchered, lying on the same gravels as the Mastodon. It makes me wonder if the same process could be followed at the Ayer Pond bison butchery site, or even the North Saanich bison find, which remains sadly under-investigated but is only palaeontological as far as we know. I was also surprised to read that so much effort was out into this site over the 10 years before the Mammoth Trumpet piece – a lab was set up, etc – and yet so little was put into the scientific literature. It’s a shame – useful palaeontological data not to mention archaeological must lurk somewhere, ready to be written up and pushed out. As I know all too well, until you’ve published results, you haven’t actually done anything at all. All in all, the article is worth checking out and indeed the whole CSFA website contains some rich information about the all aspects of the most ancient occupations of the Americas. Emanual Manis died in 2000. In 2002 Clare Manis donated the two-acre site to the non-profit Archaeological Conservancy in his memory. The article makes it clear we have a huge debt to the Manis family who very easily could have ignored the find or not allowed research to continue on their property. Elephants never forget, they say, and neither will this one be forgotten, nor the landowners who brought it to light. The Manis name will live on through the high profile the Mastodon site will continue to enjoy, especially when the new developments are published, which I expect we will be seeing very soon, indeed, and in the highest profile journals of the scientific world. Emanuel "Manny" Manis poses with Mastodon tusks in 1977. Source: Sequim Museum. This entry was posted in Archaeology, Northwest Coast, palaeontology, Washington State and tagged Manis, Manis Mastodon, Mastodon, pleistocene, pre-clovis, Sequim, zooarchaeology. Bookmark the permalink. Thank you for sharing more on this fascinating topic! In 2010 I had the honor of meeting Clare Manis, along with a group of Anthropology Club students, when we were visiting Museums and sites on the Olympic Peninsula. She very graciously took the time to walk out and meet us (in the rain), and spoke with the students for quite a while, telling the story of how the site was discovered and the extensive field work (and associated publicity!) that was conducted there. It is gratifying to learn even more about the discoveries from the site, and I eagerly look forward to the report and more updates on this . Hi Kathleen, Thanks for your comment and your observation about Clare Manis. It’s good to hear about non-archaeologists who get so passionate and committed about the field, and for public education as well. I forgot to include it in my post, but the same correspondent who sent me the link to the Mammoth Trumpet also sent along a link to the following Seattle Times article from 2003, with a choice quote from Gustafson. Such folks, though, are few. Prize fossils can’t just be carted around like a P.T. Barnum sideshow. But times change, and he’s got a plan, possibly involving digital cameras. Hard to imagine, but even as recently as 2003 digital cameras were quite a novelty. Masters Thesis, Washington State University. It’s too bad that so many MA theses never really make it off the shelves. With dSpace and similar programs this is changing of course, bringing a whole host of research out into the light – of variable quality of course but each one has, after all, in theory, been checked out by a committee of academics and found to meet at least a minimum standard and hence have some worth. And the good ones are very good indeed. Anyway, I wonder if I can spring 10 bucks for the above. Hmmmm. It is interesting to read that trumpet article – clearly there was almost no funding for this project and much of the work that Gustafson did was on his own dime, or through private donations. This makes me regret the harsh tone of one of my comments on an earlier post of yours about the Manis site in which I criticised the lack of publication. I did wonder at the time if it was because funds were limited, and that would seem to be a contributing factor to the lack of publications about what is clearly an important site. I think it is also important to keep in mind the political situation in the US at this time – when Reagan came in some important archaeological work came to an abrupt end (such as the Ozette project) and funding was pretty hard to come by for many projects in the early 80’s. I am looking forward to seeing the results of the CSFA work published in Science. If Gustafson is still alive, I hope that he is pleased with whatever they have come up with. And, since it is a safe bet that Science would not publish negative results or results of purely local importance, I think we can count on some important results of international note. qmackie – we expect your earliest report on the article since many of us don’t have access to online versions of Science and other journals. Thanks for the great job of getting this story out and keeping all of us eagerly waiting the next installment. APM – agreed, I hope Gustafson gets his due in any fothcoming publications. I note looking back at that first post from March 2010, that reader ‘Comstock’ actually tipped us off to analysis being underway, a comment I was a little dismissive of perhaps! I published a book about the Manis Mastodon, titled, “In a Scoop of Dirt: How Digging a Pond Changed North America’s Prehistory.” I am Emanuel (Manny) Manis’ daughter. I dedicated the book to my father, a man with an insatiable curiosity. I wrote the book to share my enthusiasm for archaeology, using my personal photo library and anecdotes. General information is available at http://www.manismastodon.com and a shopping cart to order the book is at my author website at http://www.shirleymanis.com. No other book has been written about the site! It has been 40 years since the inception of fieldwork at this site, Long ago a proper site report should have been published by someone. Will there ever be one? I should hope so; however, it seems unlikely. A scientific experiment (in this case, an archaeological excavation) is not concluded until the results are promulgated. Dear reader, will you be the one to give us what we need?????? Richard, I take your point and it would be very desirable to see a full report, if indeed one can be made, given Gustafson’s death. As a short term goal, then getting the MA thesis by Runnings (noted above) digitized, and perhaps someone could work up a publication around the taphonomy, which sounds suggestive. This site is a little unusual in that it has always lived or died on the embedded projectile point. More contextual information would be great, but I feel fairly lucky that it got a second look at all. Many thanks for your communication. It would excellent if Delbert Gilbow’s 1981 dissertation should become widely available and Anna Runnings’ 1984 Master’s work become accessible. I have read both documents, and was pleased to have the data. Gilbow speaks (mysteriously) of a caribou antler under the left ulna of the primary proboscidean, and Runnings studied two “artifacts” made from mastodon (?) vertebrae. She did not realize, however, that the polish and striae upon them were likely produced by blows of a stone axe used in butchering and that these objects are not tools at all. Similar damage is to be seen upon the skeleton of the Bowser Road mastodon, Orange County, NY, which is a Clovis-age association of man and mastodon. I draw readers’ attention to the site report that exists for the Bowser Road site. 82 bones were partitioned with a stone axe. Well over 200 bone and antler artifacts had been ritually deposited upon the proboscidean’s skeleton. 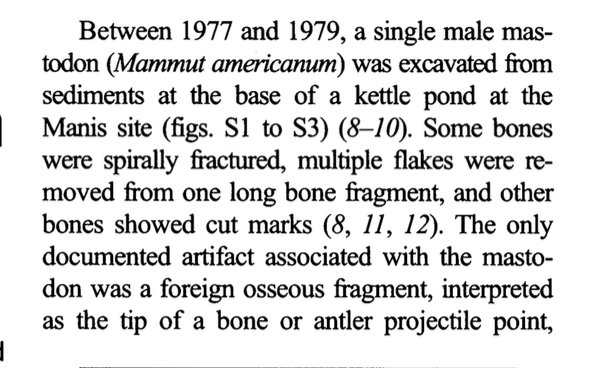 A reminder: That “projectile point” was deemed by a UC-Davis elephant expert, who looked at the X-rays, as more likely to have been bone from the animal’s own skeleton since there was no sign of any infection from a foreign object, which would be expected. Delbert is the one who sent me the radiographs, which I forwarded on to the elephant expert. I relayed his comments back to Delbert. Yes, indeed a detailed site report would have been much preferable before sending out all the publicity on this site. One would expect to find no sign of infection if the bone projectile point (and others like it) had penetrated the spine or other organs and caused death. Numerous lance-points made from split proboscidean rib have been unearthed at the Hiscock site (NY), the Bowser Road site (NY), and the Cedar Fork Creek Mastodon (OH), They come in two basic types, namely, 1) wide, lath-like lance-points with acutely pointed tips and shoulders at the end used for hafting AND 2) narrow, spikes, 8-9 inches long when freshly made. I am skeptical that flint-tipped spears were much used for killing proboscideans. 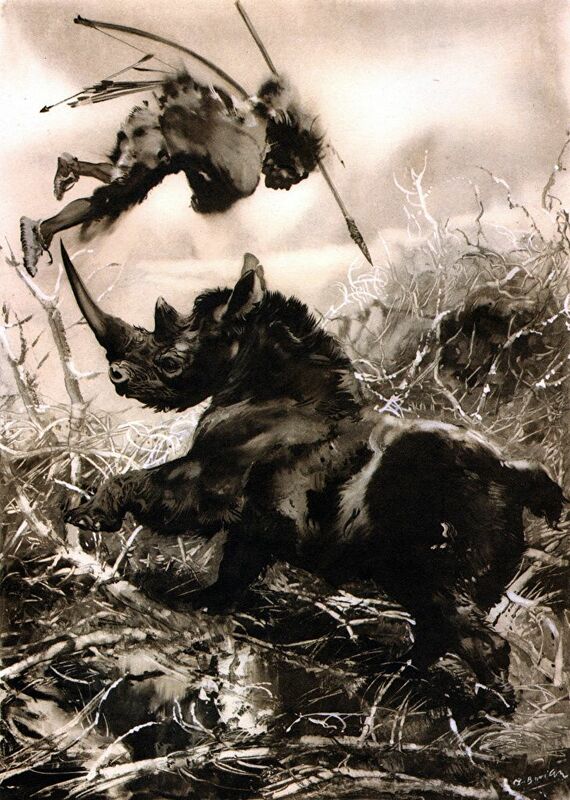 Rather, I believe that far more often proboscideans were taken by a combination of severing the Achilles tendon (causing the animal to fall) and jabbing the vitals as it lay (somewhat) incapacitated upon the ground. In any case, I should think the Manis animal died in this manner. The astragali and calcanei should be checked for marks of the axe that severed the Achilles tendon! Thanks for your reply. 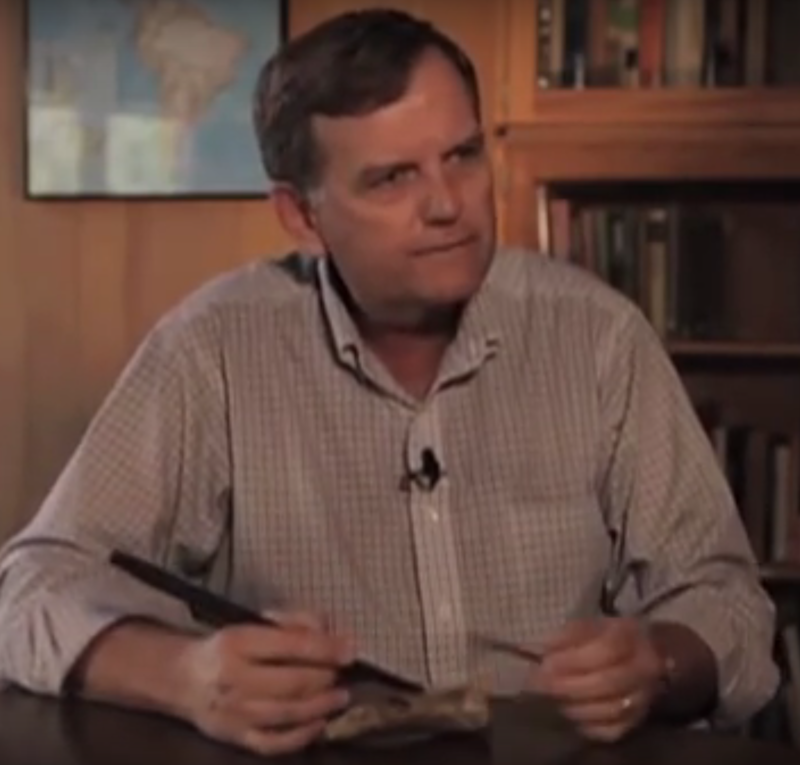 I made a screen cap from the Mike Waters video where he shows a SE paleo-bone point which appears to be at least 20 cm long. I am sure there are lots of ways of killing a Mastodon, including your methods. Traps have been suggested. Frison did a famous experiment on elephants. Obviously stone projectiles are likely. And bone technology, with the ability to make long, strong, and narrow points which can penetrate deeply may well be crucial as well – if for nothing else, then to work as a killing lance once the animal is down. The normal advantages of stone projectiles — including a wider, messier wound channel — may not be as relevant if they have difficulty penetrating deeply enough. The Manis point trajectory: coming in at an angle, from above and behind, could suggest ambush from higher ground, or, as likely perhaps, one of a series of killing blows inflicted with thrusted spears or atlatl darts onto a downed mastodon — the one in question at Manis thus designed to pass easily between the ribs and puncture some vital organ or other. (It’s a story, but more plausible IMHO than some other stories bandied about, such as that the mastodon tripped and fell awkwardly). My point is, we should expect that these people have all the technological resources of Upper Paleolithic people. This includes technological choices made on a case-by-case basis (and there is wide evidence for bone technology at, for example, Wenatchee, and the tip of a bone point ca. 12,000 calBP on Haida Gwaii.) If these were coastal people they had a lot of organic technology chops. With new finds on the central coast, we know outermost islands were occupied between 13,000 and 14,000 – those people must have had boats, and likely were oriented to sea mammals. Anyway, yes, check the calcaneous of all your mastodons, folks. Indeed, but wouldn’t you expect to find butchering marks on bones or even some flint tools? And, I am merely passing along what the UC-Davis elephant expert, who specialized in elephant diseases, told me in a letter after examining the radiographs. IMO too much stock is being placed in this one and only feature to be able to say that the Manis Maston site is unequivocally a Paleo-Indian kill or wound site. Especially without a detailed site report. You raised the issue about the absence of butchering evidence upon the Manis Mastodon. But is there not such evidence — although I’ll admit it has not been searched for systematically? 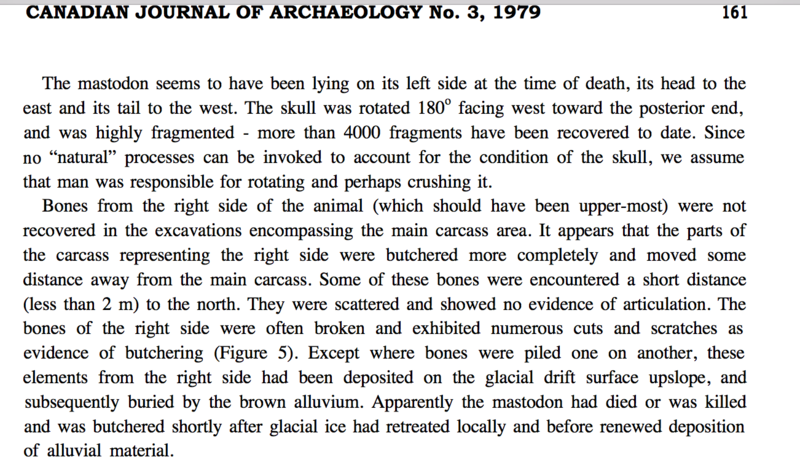 Read Anna L. Runnings 1984 dissertation and you will see two mastodon vertebrae that may have been chopped with an axe. She felt that such marks resulted from the vertebrae being used as artifacts! One cannot fault her, as finding gross butchering marks was not even “on the radar” 30-35 years ago. These days we know better. At the Bowser Road Mastodon in Orange Co., NY we discovered 82 bones that had been chopped with a stone axe. Several resembled the damaged bones figured by Runnings. In addition to the gross chops or cleaves upon the skeleton, there were many small marks that may have been made with a knife. Not every proboscidean can be expected to exhibit such gross evidence as is seen at Bowser Road. Not every proboscidean was killed by human beings. Some skeletons were merely scavenged. Until the Manis remains are analyzed systematically and completely, we cannot understand what actually occurred at that site. ‘Tis true and it is precisely my point. I agree it is frustrating not to have a complete report and/or not to have the theses done on this site available. This means we have to rely partly on peer review, and partly on Occams razor. Since there are other sites on the NW Coast with dates to almost 14,000, then Manis is not really an extraordinary or isolated claim and normally a journal article published in Science would be persuasive until there was a compelling argument against it. Thanks for your comment Ron. I assume you saw my more recent post (well, 2011!) on Manis. 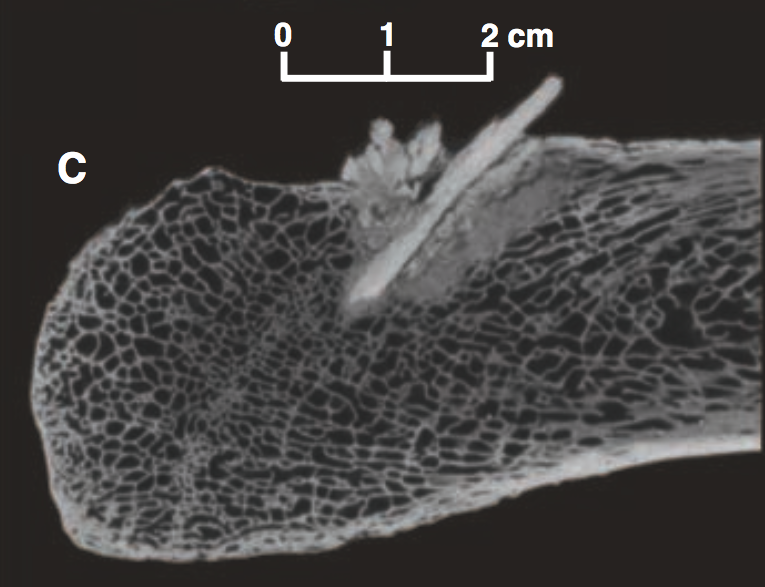 The authors note that there is no regrowth of bone around the embedded point, suggesting that the animal did not survive this and any concurrent events. If the animal didn’t survive then, as Richard Gramly says, there would be no expectation of infection. 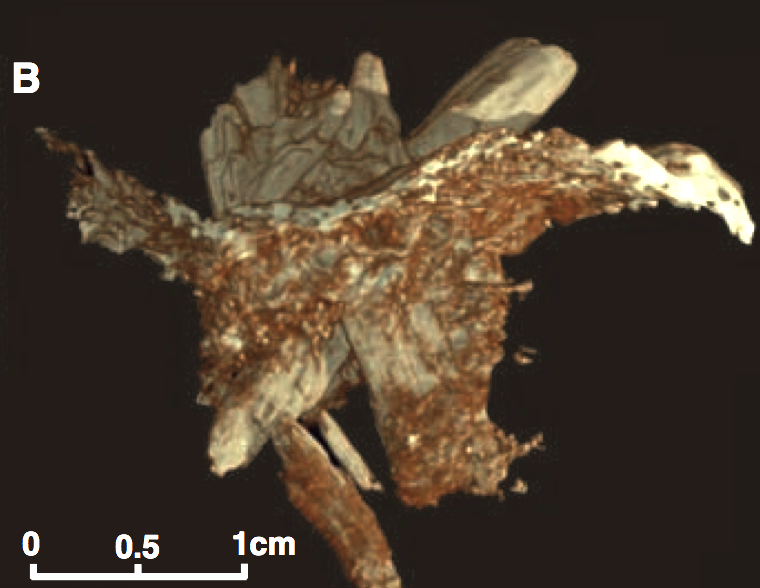 The new high resolution CT scanning shows the embedded bone is long and cylindrical, and broke within the bone. When you put it together, it closely resembles a bone point of a similar type known to have been used in the early period elsewhere. “The eruptive tissue” around the entry point is best understood as being remnants of the shattered bone point itself. The force required to penetrate hard proboscidean rib (as we observe in the case of the Manis mastodon) must have been great. The question is: Was the bone-tipped implement propelled by an atlatl or was it thrust into the rib by a strong hunter using a stout spear? Such long bone spikes are well known for Clovis-age sites east of the Mississippi R. Splitting hard proboscidean rib in order to manufacture points and other implements was an important feature of the Upper Pleistocene Gravettian archaeological culture across Eurasia. For this reason, and others, I consider Clovis to have been the easternmost manifestation of Gravettian. You may know of the interesting paper by Pavel Nikolskiy and Vladimir Pitulko 2013 Journal of Archaeological Science. They document mammoth wounds at the UP Yana site in NW Beringia (30,000 years old). You can see in this figure one mammoth was struck by a bone point in the right scapula, a different mammoth was struck in the right scapula by an osseus point. Whether “Gravettian” is a useful term for Pleistocene North America I’ll leave for others….. I have seen that radiograph. It looks like the same one I sent to the elephant expert. It doesn’t impress me as being cylindrical, and to say that it is would seem to require a debateable reconstruction of the fragments. As I recall, the elephant expert told me that the even-sided splinter could easily be a fragment of one of the mastodon’s own ribs. In a fight, the force by the impact of another mastodon’s tusk would be quite enough to break one rib and jam a splinter into another rib. Being the same tissue, this would explain the lack of infection if the animal survived only to lose his life in a bog. I am at a disadvantage because I do not have access to the CT scan. Have you seen it? Or are you relying on what somebody else, who may be biased, has said about it being cylindrical? That is the key. If it is indeed that shape, I will be quick to concede that it is a bone point. But, without that and direct supporting evidence, as opposed to inferences drawn from other sites in the country, I remain skeptical about Manis being a Paleo kill or wound site. in both the Old and New Worlds are. In the Gravettian, for example, there are flat points (laths) made of split mammoth rib. At the Hiscock Clovis site in western NYS we have such flat points (There are 16) in addition to long, narrow, prisms of rib bone (There are 28) that have been split down the edge of a proboscidean rib. Trimmed into a more quadrilateral shape and brought to a point, such spikes would make formidable weapon tips. (Again, there are TWENTY-EIGHT examples in the Hiscock assemblage!) I believe it is a fragment of one of those spikes that is embedded with the Manis Mastodon. 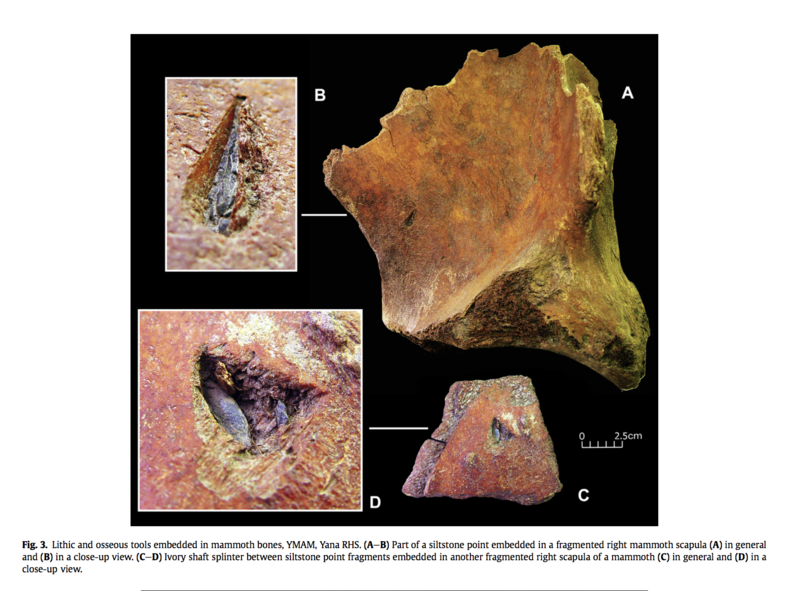 If you want to explore what these prismatic spikes are capable of doing, read Richard Laub’s essay about curious “divots” upon mastodon ribs at the Hiscock site (published in CURRENT RESEARCH IN THE PLEISTOCENE). I have seen this evidence for myself at the Buffalo Museum of Science where the Hiscock site collection is housed, and, believe me, it is impressive. The idea that the point within the Manis rib is a piece of the mastodon’s own body seems a bit contrived; please show me another example of such an occurrence and I might begin to entertain this idea. Once Manis is thoroughly studied, we will be in a better position to know what happened there anciently. Some curious misconceptions have arisen about that site — such as the apparent confusion over a mastodon hyoid bone which was thought to be a female caribou antler !!!! — and these rumors have to be laid to rest. As long as dialogue is kept flowing about Manis, there is some hope that a dedicated researcher will give us what we have been waiting for a long time – a full treatment in the form of a site report. I look to some scientist in Washington State (perhaps an aspiring PhD student??) to buckle down and do the job. I can’t imagine the Paleo hunters using flat bone points to attack the bony, upper part of a mastodon unless they happened to be standing above it on a bank and they didn’t have anything else in their tool kit. If it also contained foreshafts with pointed, cone-shaped or cylindrical points, I think they would have preferred to use them in that circumstance. Could be the same width, but stouter and a better chance of avoiding snapping or splintering upon hitting a rib bone. Even the thick, armour-like hide around the neck would, I think, be capable of breaking a flat point loose from the haft if it wasn’t thrusted just perfect. Again, the key on Manis is whether that object in the rib is cylindrical. It shouldn’t be that hard to publish the findings from a CAT scan in a first-rate journal using impartial peer reviewers and cross-reference it to a video on the internet for all to see. If these Paleo hunters’ usual strategy was to attack such an elephant’s underbelly, they might prefer to use easier-to-make, flat bone points for that purpose. 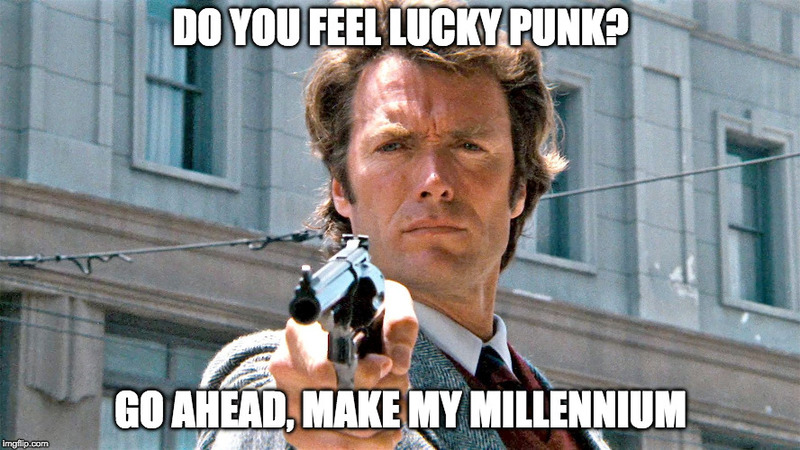 I say these things not because I stayed up-to-date with the literature after retiring early almost 25 years ago–I haven’t–but because to supplement my annuity I took up, among other things, hunting wild hogs as a profession (at the age of 60). With my dogs I have killed over 1500 of them, half with just a 6 inch blade knife, the rest with buckshot, and I have butchered in the field and cooked over 1000 of them. I know from experience just exactly how, without a saw, to use only my knife to completely disarticulate a hog (or deer or blackbuck) on the ground on its back and strip it bare of meat and organs in short order–even taking the tenderloins out without ever gutting the animal. Some weighed over 400 lbs. I have not thrown a spear at any of them–too dangerous when you hunt alone like I did most of the time. So I have nothing to offer there. Wish I could have been there to see how these skilled Paleo hunters did their thing with much larger, more dangerous, and tougher-hided animals. Amazing people. Fair enough, but have you seen the animation of the CT scan? There are a series of slices through it at sub-mm scale, and a 3-D rotatable model with cancellous bone removed that is fairly convincing. Further, the bone density of the bone object rules out it being a rib. Longer video with 3D model demo: https://www.youtube.com/watch?v=sFK4FCvb82E Note that you the tip broke and displaced to one side, so when you mentally rotate it back it helps. Does the CT scan conclusively show for any dispassionate observer that the object is cylindrical, and have you seen the original scan such that there is no doubt in your mind of that shape? Also, on ribs as large as an elephant has, it seems to me like there would be enough thickness of dense bone on the outer part that a piece of it could be driven right into another rib, kind of like driving a straight pin through a penny using a cork–his opponent’s tusk serving as that pin. All of this underscores the need to secure a comprehensive, detailed report on the site. There’s certainly a paucity of imagination around hunting techniques, driven in part at least by a received iconography of mammoth hunting imagery. I could imagine it being either thrust or propelled with an atlatl. Ron Corbyn:Does the CT scan conclusively show for any dispassionate observer that the object is cylindrical, and have you seen the original scan such that there is no doubt in your mind of that shape? What do you mean original scan? I’ve seen the video composed of hundreds of frames of the CT scan. It’s a digital file. In any case, the test is not pure “cylindricity” (cylindricality?) since many of not most of the actual bone points I’ve seen (n=lots) are only roughly cylindrical, and often faceted. Those who have examined it conclude it is long bone. The point being (LOL) that if the two options are (a) a human made a bone point and stuck it into an animal and (b) a freak accident resulted in a fragment of a mastodon ending up embedded inside its own bone or the body of another mastodon then I would say (a) is more likely since that is a thing which is known to have happened many times and (b) is, well, “undocumented” I suppose. Further if (a) is published in a peer reviewed journal and (b) is an untested hypothesis then this doesn’t prove anything but leans me towards (a). I doubt we are going to agree on this: it is not a perfect archaeological site but the evidence is pretty strong, especially if we don’t consider people in the Salish Sea at 13.8k to require some sort of extraordinary levels of evidence. I looked at the 3D reconstruction of the object from every angle. I couldn’t see a consistent shape. At the tip it appeared semi-conical, in the middle it appeared triangular, at the top it was convex-concave. No doubt acids from decay are responsible for the heavily eroded surface. There is no gradation that I can see between the two penetrations. They are separate. The only thing I can think of offhand is that two bone fragments were jammed into the rib by a tusk from two different angles or that the victim was struck twice in rapid succession in essentially the same spot. It is tempting to look at the second fragment and say that it is a bone projectile point because it looks like one. But the first fragment that penetrated the bone doesn’t look anything like one at all, yet there it is. In short, what I see from the 3D construction is a confused mess, not something you would expect from the singular penetration of a bone projectile point. Now, Waters said that a DNA test confirmed that the object in the rib was mastodon bone. That of course leaves open the possibility that it is the victim’s own bone–perhaps a fragment from one of his ribs or from the crest of one of his scapulae. Of course, I can understand why no DNA test was done of the victim’s rib. It is mastodon without question. But suppose some kind of chemical or biological test of both the object and the rib could be done to determine whether they are from the same or different mastodons. Maybe now, maybe in the future. But perhaps more likely to be accomplished than getting a full site report after all these years.